So you have a piece of furniture you want to make new and you’re wondering where to start? The starting point is always the same – prep. Prep isn’t hard or complicated. 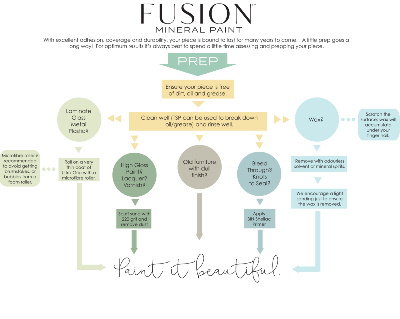 Fusion has created this flow chart to take the mystery out of prep. You see, the quality of your paint finish depends on the bond between your paint and your substrate. It doesn’t matter what kind of paint you use, if your surface isn’t prepared to receive paint, your finish won’t last. This handy chart is a great reference when you’re prepping your piece. Download your free copy here. So step 1 is to clean the surface well. You need to remove grit, grime, and oily reside that may be lingering from years of use. 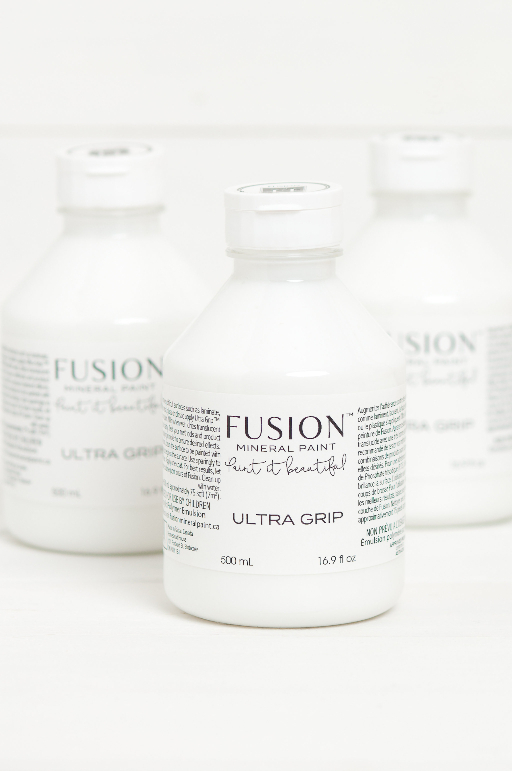 The best way to remove that gunk is with Fusion’s TSP (which stands for tri-sodium phosphate). 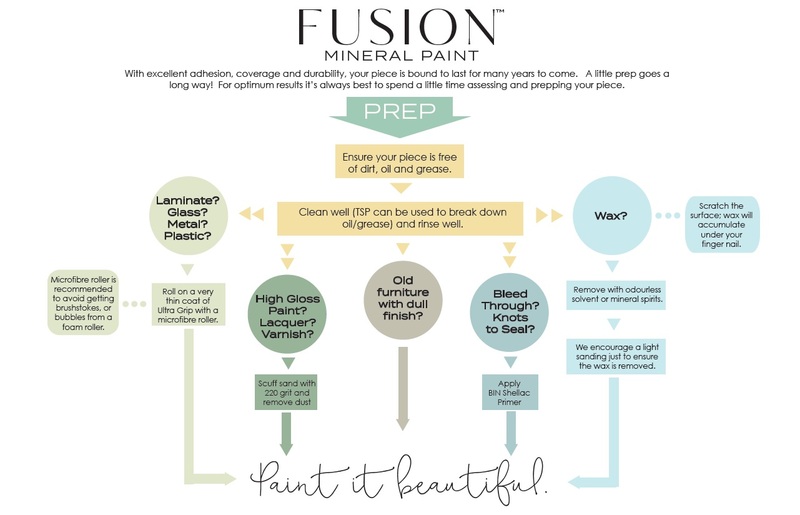 The great thing about Fusion’s version is that it’s eco-friendly and doesn’t have to be rinsed. I dilute my TSP in a spray bottle and spray it on the surface. Then I use a green scrubby to scrub lose the dirt and oils on the surface. I use a paper towel to wipe off the residue and continue the process until the paper towel wipes clean. I don’t typically spend more than 5 minutes or so on this process. These five surfaces dictate five different approaches to prep. Let’s start with slick surfaces. Want to paint glass? Most of the time, paint will bead up and not adhere to glass. This is one place where Fusion has an advantage. Many times when I paint glass the Fusion paint will stick. If I ever have trouble with paint beading up, I give it a light, first coat of Ultra Grip. Let dry 12 hours and I’m ready to paint! But I’ve only used Ultra Grip a few times on super slick, non-wood surfaces. Maybe your surface is wood but it has a glossy finish? Not a problem! 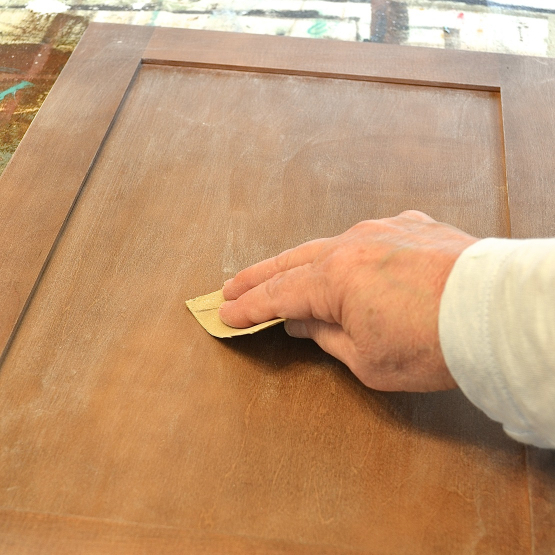 Take a piece of 220 grit sandpaper and quickly scuff sand the piece. I don’t mean sand off the finish! No need to whip out a power sander. Just scuff enough to get a sawdust residue. This show’s you’re making microscopic scratches in the surface. That’s all you need for the paint to adhere. Maybe your refinishing a piece that’s been painted and waxed in the past. Honestly, I tried to avoid these. The wax has to be removed and it can be a pain to do it. You’ll need mineral spirits and rough sponge or green scrubby. Apply mineral spirits and scrub to remove the wax. The mineral spirits will dissolve the wax. It’s just important to get it all removed. Another issue that rarely occurs but can be a real issue is tannin bleed. Tannins exist in some woods and are drawn out by moisture. The most troublesome is mahogany, cherry, pine and oak. If you paint over these woods, especially with light colored paint, you can get what is affectionately called “bleed through.” The tannins in the wood are drawn to the surface by the water in the paint. Sometimes it doesn’t happen until a water-based top coat is applied. The result is that you’ll see pink or yellow blotches in the paint. The only thing that blocks bleed through is shellac. My go-to is Zinzer BIN in the red can. If you’re painting one of these troublesome woods, you should apply a couple of coats of BIN before you paint. (Note that not all primers are the same. 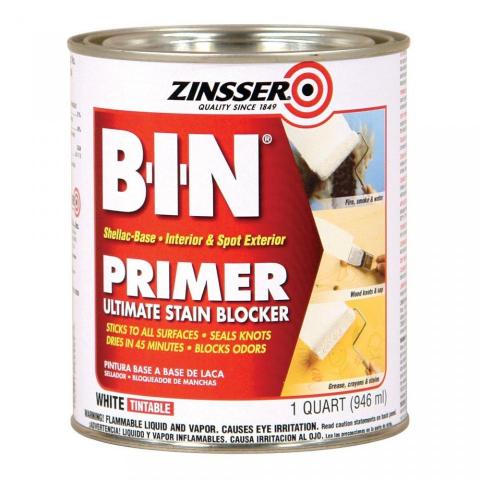 “Stain blocking” primers can’t block bleed through unless they contain shellac.) . If you’ve started painting and then discover you’ve got bleed through, don’t panic! Apply a couple of coats of BIN over your paint and once dry, finish painting. Most of the time, I’m painting a piece that is worn and tired and ready for new life. So most of the time, I clean and then paint! That’s it! It may seem like I’ve covered a lot of things that are a lot of work. But really, your piece will only fit into ONE of these categories. You’ll typically only have clean and do ONE thing to get ready for painting. Tempted to skip the ONE thing and get your paint brush wet? Just remember that if things go poorly with your finish, it’s a lot more work to go back and fix it. 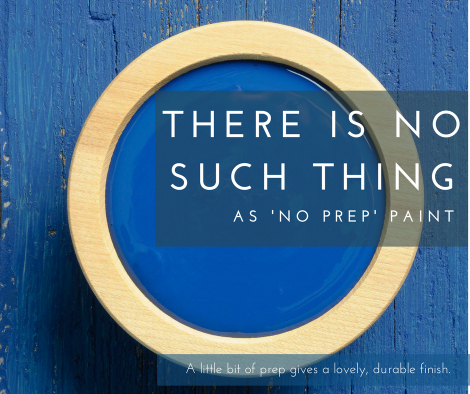 And remember, there’s no such thing as no prep paint because prep is based on your surface and not the paint. So embrace the prep! This is a $35 value for just $29.99. You can order your prep kit here. When I receive your order I will email to find out what size sanding glove you need.